Hello everyone! Today I'm here with Day Five of the Christmas Card Series for this year. Today I'm gonna be creating a simple design that you could mass produce if you wanted too, using WPlus9 stamps, Simon Says Stamp inks and the MISTI tool. So this is the card I made for todays video. It is a pretty simple design, but I think it's quite lovely and would be nice and quite easy to mass produce. So to start off I stamped out all of my images using my MISTI. I just stamp them in steps to make it faster. So I first did the first layer of the poinsettias, then the second layer on all, then the third layer on all and then the middles of them. I then moved onto the leaves and did the same steps. I then die cut them all out using the coordinating dies. To create my background panel I used the Index Card dies by Mama Elephant I first die cut out the gold piece out of the scalloped frame in the set (which I apologise for the bad photo of it, the camera doesn't capture it well at all) I then used the other frame which is the rectangular one in the set and cut out the centre of the scalloped piece. I then used Neenah Solar White in the 80# weight and cut out another rectangular piece to slip inside the scalloped piece - I just did it the long way to save on gold cardstock. I then used some tape at the back to hold them together, so it would be easier to adhere. I then used some Versafine Onyx Black Ink to stamp out the sentiment which is from the Merry and Bright set by WPlus9 onto the white panel. I then took some adhesive and adhered my panel onto my card base which is Desert Storm cardstock by Neenah also and it's cut to 4" by 11", scored at 5 1/2" to create a 4" x 5 1/2" card base. 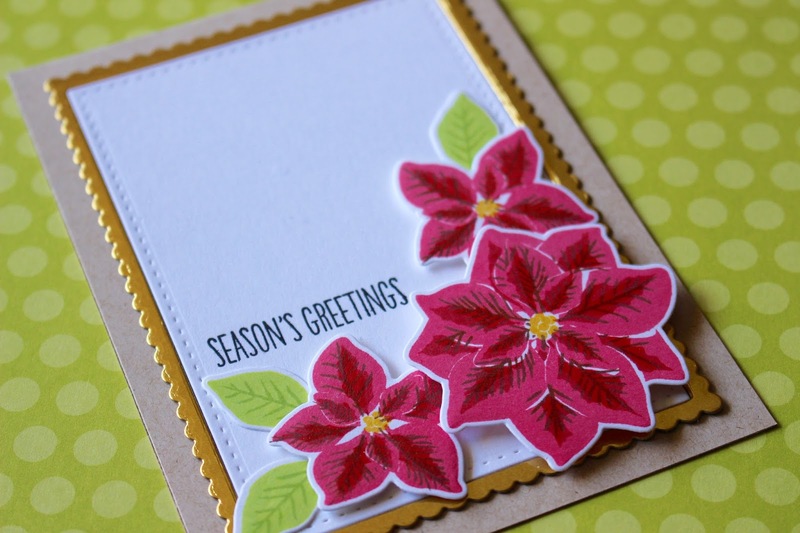 For the poinsettias, I adhered down the leaves directly onto the card. 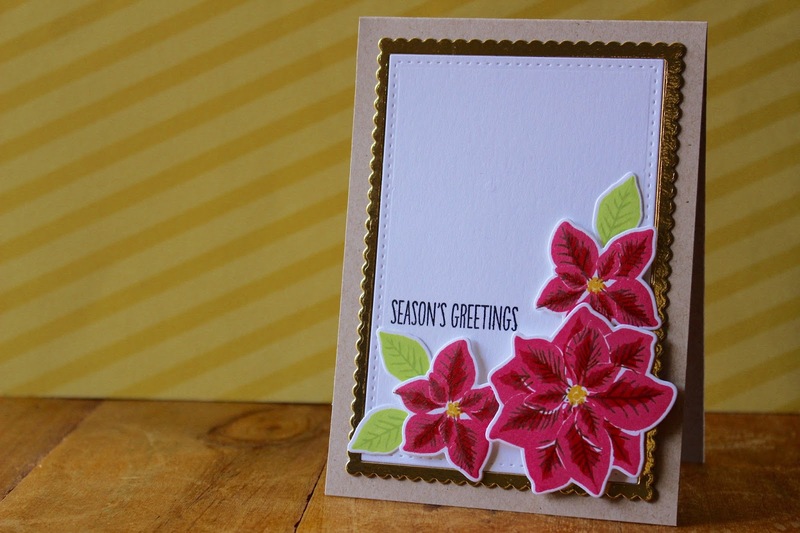 I then used some 3M foam adhesive to adhere down the smaller poinsettias onto the card. I then took some taller foam adhesive from American crafts to adhere down the large poinsettia. I wanted different heights of them to create a nice effect. I then went over the images with my clear wink of stella pen and the card was complete. I hope you enjoyed the video and card today. I love hearing from you so feel free to leave comments! I will be back again soon with Day Six.